Harry Berry in England kit. Harry Berry made 137 appearances for Gloucester between 1907 and 1912. He started his playing career as a threequarter, but Gloucester moved him into the pack, where he proved to be a fast and clever forward who particularly shone in the lineout and in loose footwork. Harry was born in Gloucester on 8 January 1883, the son of a dock labourer. In his youth he lived at 4, and then 42, Columbia Street, Gloucester. Harry joined the British Army at age 16 in 1899, and initially served with the 4th Battalion, Gloucestershire Regiment, on St Helena guarding prisoners from the Boer War. In 1902 he was transferred to the 2nd Battalion and fought in mainland South Africa. After the war he was sent to India and spent five years there with the 1st Battalion before returning to Gloucester and civilian life in 1907, although he still remained an army reservist. He was an innkeeper, initially at the Red Lion, Northgate Street, and later at the Stag’s Head, Alvin Street. Harry played his first game for Gloucester on 14th December 1907 against Leicester at Kingsholm – Gloucester won a close match 8-6. Harry went on to make nine appearances that season, but caught the eye sufficiently to warrant a mention in WB’s end-of-season review – “Berry and Griffiths found places in the later matches, and both shaped so well that they should have little difficulty in maintaining their positions another season”. At the start of the 1908-09 season, Harry scored three tries for the Gloucester 1st XV against the Next XVIII, but the first team were severely tested in a 26-22 win. Harry scored his first try for the Club in a fully competitive match against Old Merchant Taylors on Boxing Day 1908, contributing to a narrow 14-13 victory. This was Harry’s first full season for the Club, and he played in 29 of the Club’s 37 fixtures. He scored a hat trick of tries in the pre-season match for Gloucester against the Next Later in the season he added to his try count against London Hospital, Cheltenham, Leicester, London Welsh and Castleford, this last in a match won 75-5. At the end of the season, WB commented “not such a skilled exponent of forward work as his colleague (Johns), still Berry has other advantages, and we feel sure the best has not been seen of him yet”. His talent was quickly noticed by the County selectors, and he made his first appearance for Gloucestershire against the Australian tourists at Kingsholm on 1st October 1908. This match was lost 0-16, but Harry retained his place in the side for a 12-5 win over Glamorgan, and then played in all five County Championship games, the County finally being eliminated in a play-off against Cornwall. He scored his first try for the County at Kingsholm on 5th December 1908 during the 20-9 victory over Somerset. His other appearance for the County that season was also at Kingsholm in the 39-0 win over Racing Club de France on 24th December 1908. He was soon prominent in this game – “a clever move by Dix and a pass inside to Berry saw the City forward burst away, but on reaching the full back he lost the ball, and a Frenchman gathered and saved…. Berry being to the fore with a strong run…. Forward Johns, Hyndman, Berry and Williams were the most conspicuous”. Harry played so well at this higher representative level that, despite his lack of experience, he came to the attention of the England selectors, and was chosen as first reserve for the match against Wales in Cardiff on 16th January 1909 (the match in which his Gloucester teammate, Billy Johns, made his international debut), but he was to have to wait another year before gaining his first cap. In 1909-10, he scored a try in the second game of the season, a 3-3 draw at Abertillery, and went on to play in 29 of Gloucester’s 38 fixtures, of which they won 23, lost 8 and drew 7. Harry’s other tries came against Cheltenham (home and away), Plymouth, Cardiff and Leicester. Harry also won seven more caps for the County, missing only one game as they fought through two replays to emerge from the south-west group, and scoring a try in the 21-14 win over Somerset at Weston-super-Mare. Harry was one of six Gloucester players to travel to Blackheath for the semi-final against Kent, and a tight game was won, 6-3. The County Championship Final was played at Kingsholm on 9th April 1910, and Harry was one of six Gloucester players to take the field. The day was a grand one for the County. This was only the third time that Gloucestershire had progressed beyond the SW group, but they won 23-0, and secured their first CountyChampionship. At the Club AGM in the summer, gold medals and photographs of the Gloucestershire team were presented to the City players who took part in the final. Harry’s talents were recognised by the England selectors, and he was selected to play for the England team which beat the South 28-6 in the first trial at Twickenham on 18th December 1909. He was retained in the England team which went down 10-18 to the Rest in the final trial at Twickenham on 8th January 1910, but was selected for his first England cap a week later. This first International cap came against Wales in the very first international played at the new stadium at Twickenham on 15th January 1910. In the run-up to the match, Harry was described as “a finely built scrummager” who was “very conspicuous for Gloucestershire v the Australians” and “in the West, Berry is regarded as a great forward.” He played alongside his Gloucester teammates, Dai Gent and Billy Johns. It was a wonderful occasion, not least because of victory by 11 points to 6, the first win over Wales since 1898. Billy was described as “very clever with hands and feet, and can do his full share in the scrum”. All three Gloucester players kept their places for the next match against Ireland at Twickenham on 12th February 1910, which ended in a 0-0 draw. The match report speaks of: “Berry and Johns were prominent with dribbles”, but they were playing in a beaten pack. England moved on to Paris, this time selecting four Gloucester players – Harry, Dai Gent, Billy Johns and Arthur Hudson – to play at Parc des Princes on 3rd March, although in the event Gent was unable to play. 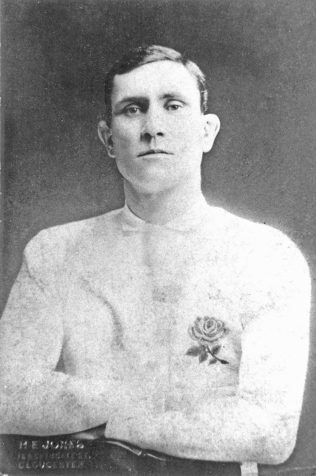 England won 11-3, with 2 tries from Hudson and one from Berry – “ten minutes after the start, Berry scored the first try”. Harry, along with Johns and Hudson, was retained in the team for the final International of the season against Scotland at Edinburgh, but only Harry was fit to play He scored another try in helping England to a 14-5 win – “There was a line-out very near the England goal, but Berry recovered the ball from the throw in, and being backed up by Birkett, the ball was carried to near the centre….A forward rush by the England forwards followed, and Chapman picking up raced through. Ward and Pillman took up the running, and Berry finished the movement by scoring.” Harry had played for his country in all four matches, and this win gave England the International Championship for the first time in 18 years. WB summed up his season – “H Berry fully sustained his reputation, and the ex-soldier deservedly gained the coveted cap, appearing for England in the four matches played. That the Gloucester man was able to retain his place in the face of so many changes made in the International side was clear evidence of the Committee’s appreciation of his abilities.” After only two seasons of first class rugby, Harry had reached the peak of the game – he was a star player with a top club, he was an Army champion, a County champion, and an International champion. In 1910-11, Harry played in 30 of the Club’s 40 fixtures, and enjoyed his most successful season as regards try scoring with eight – against Bream (2), Stroud, Clifton, and Cinderford (making 5 tries in the first 6 matches of the season); and later in the season against Lydney (2) and in the return fixture against Bream. The highlight of this season for Harry and the rest of the Gloucester team was a trip to Toulouse, which took 6 days to complete – one of the players described it as “the time of our lives”. The Gloucester party travelled for three days, with overnight stops in London and Paris, to reach Toulouse. Gloucester won the game played at the Stade Toulousain on 28th February 1911 by 18 points to 13, The Toulouse club entertained them royally that evening, and the players took another 2 days travelling home. They may have been exhausted when they arrived back in Gloucester late on Thursday evening, but they had a match to play against Swansea on the Saturday, and they managed to win that 13-6. At the end of the season, WB commented “the other older members of the pack – Holford, Berry, Wyburn, Pegler and Griffiths – worthily sustained their reputation”. He won three further caps for the County, but they failed to progress beyond the group stage. He was invited to play for the South v England in the first England trial on 10th December 1910, but was not selected for the final trial, and his International career was over. In 1911-12, Harry again put in a full season for Gloucester, making 30 appearances out of the 40 fixtures. He scored tries against Clifton (home and away) and Bristol. WB thought that “Berry, after going back somewhat, came out strongly again, and his form in the later matches equalled his best”. His services were not required by the County until they reached the semi-final, when Harry was brought restored to the team on 29th November 1911 against Hampshire. Gloucestershire lost and this proved to be Harry’s final appearance for the County. In 1912-13, Harry played his last eight games for the Club, and scored his last try on 25th September 1912 against Cinderford. His last two games were on successive days, playing in a 15-3 win over the 1st Gloucestershire Regiment on 27th December, and in a 3-3 draw with Watsonians on 28th December 1912. Harry was forced to retire from the game owing to a recurrence of of malaria, a disease he originally contracted during his army service in India. He finished his Gloucester career with 136 appearances and 24 tries. At the outbreak of the Great War, Harry, as a reservist was re-called to the Colours as a Corporal with the 1st Battalion, Gloucestershire Regiment. He did not go to the front straightaway but served as a military policeman at Woolwich. 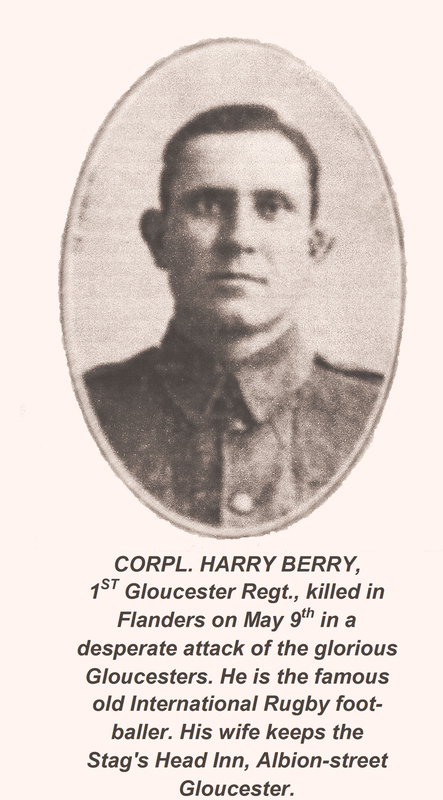 He was subsequently sent to France and landed at Boulogne on 2 February 1915. This same draft included fellow Gloucester players, Harry Barnes (centre), Albert ‘Car’ Cummings (stand off), Charles Rose (front row) and Fred Goulding (second row). As well as enemy activity the second wave now had to contend with the dead and the wounded from the first wave which littered no man’s land. The assaulting lines of the 1st Gloucesters and the 1st South Wales Borderers advanced eighty yards before the intensity of the fire forced them to lie down and seek whatever cover was available. The bodies of Harry Berry (age 32) and Harry Barnes (age 27), were never recovered. They are commemorated on Le Touret Memorial in northern France. They are also commemorated on the Gloucester War Memorial and the Gloucester Club’s two war memorials – one now situated in the Lions Den, unveiled in 1920, and the other on the Stadium outside reception, unveiled in 2013. Beatrice Berry never remarried and died in 1965.